The run for Ella was a success, there were tons of people there to run and some there just for support, but it was great fun and for a great cause. Miss Ella was also there with her family to give out the awards. I was so happy to see how our small town has come together for this little girl. Anyway, my goal for this run was 40 minutes but I didn't allow for such a rough terrain and so many people. I finished in 46 minutes and was really happy about that. There were places in the trail that two people could not run side by side so if you got behind walkers then you had to wait till you could pass. I was happy with my time and more happy that I finished the run. 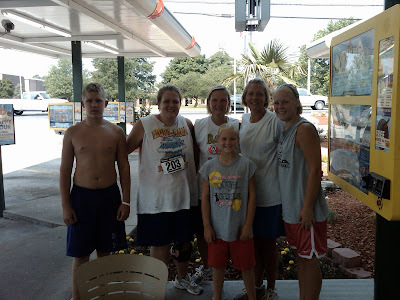 I had quite a crew that ran from my family, this picture is from the Sonic stop afterwards, we needed some liquid after such a hot run. Oh my goodness...who are those grown kiddos??????? Good to see pics of you all. Miss you guys.